Welcome to the 2011 iGEM World Championship Jamboree! 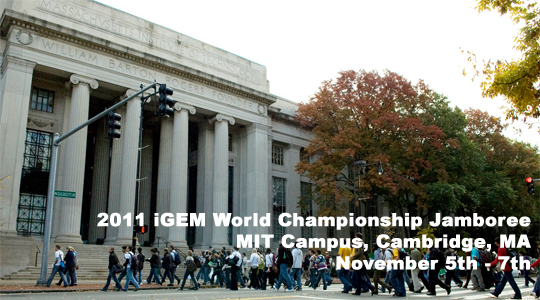 The World Championship is being held from November 5th - 7th on the MIT campus in Cambridge, MA, USA. Be sure to Register by October 28th! Congratulations to all! See the Results Summary to see the winners! The Awards Ceremony will be streamed live, just follow this link. Make sure you have Adobe Flash 10.3 or higher installed! 11-7-2011: The World Championship Jamboree is now over! Congratulations to all of the participating teams. See the summary of results here. More details, photos, and videos will be coming soon. In the meantime, watch the video of the Awards Ceremony! 11-4-2011: iGEMwatch and their team of bloggers will be liveblogging from the Championship all weekend! Check them out here! 11-2-2011: Be sure to follow our updates via Twitter! 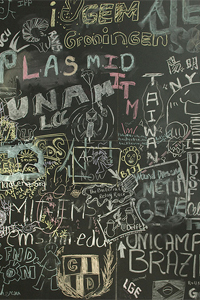 The official hashtag for the World Championship Jamboree is #iGEM2011Championship. 11-2-2011: An updated schedule has been posted online! It's available in PDF, and a hard copy will also be in your registration packet. 10-31-2011: Autodesk is hosting a workshop! See complete workshop schedule here. 10-27-2011: Judging forms are now available! 10-24-2011: The schedule for Practice Sessions is up! 10-16-2011: The results are in! All the regional Jamborees have finished. Check out the teams that are advancing to the World Championship Jamboree.